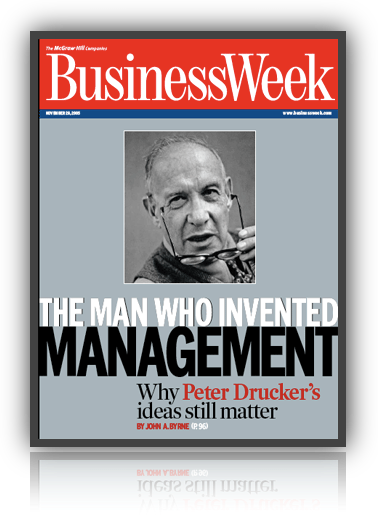 Throughout his professional life, Peter F. Drucker inspired millions of business leaders not only through his famous writings but also through his lectures and keynotes. These speeches contained some of his most valuable insights, but had never been published in book form—until now. During his life, Drucker well understood that over the last 150 years the world had become a society of large institutions—and that they would only become larger and more powerful. He contended that unless these institutions were effectively managed and ethically led, the good health of society as a whole would be in peril. His prediction is unfolding before our eyes. "The Drucker Lectures" is a timely, instructive book proving that responsible behavior and good business can, in fact, exist hand in hand. 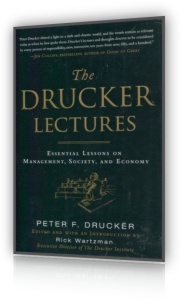 Praise for "The Drucker Lectures"
"Peter Drucker shined a light in a dark and chaotic world, and his words remain as relevant today as when he first spoke them. Drucker's lectures and thoughts deserve to be considered by every person of responsibility, now, tomorrow, ten years from now, fifty, and a hundred." -Jim Collins, author of "Good to Great" and "How the Mighty Fall"
"Rick Wartzman has brought Peter Drucker alive again, and vividly so, in his own words. These samples of his talks and lectures, because they were spoken not written, will be new to almost all of us. A great and unexpected treat." -Charles Handy, author of "Myself and Other More Important Matters"
"Peter Drucker's ideas continue to resonate powerfully today. His lectures on effectiveness, innovation, the social sector, education and so much more provide fresh insights that extend beyond his other writings and provide lessons for us all. This book is a gem." "Rick Wartzman has performed a great service in pulling together "The Drucker Lectures". The collection is as far-ranging as Drucker's thinking and writing. If you have sampled Drucker before, you will find things you haven't seen. Peter's ideas live on. You will be energized by reading them anew." "Peter Drucker inspires awe. From the 1940s until his death a few years ago, he displayed a combination of insight, prescience, and productivity that few will ever match. This superbly edited collection captures both the range of Drucker's thinking and the sweep of history that informed it. "The Drucker Lectures" is a riveting read that reveals the depth and subtlety of one of America's most remarkable minds." -Daniel H. Pink, author of "A Whole New Mind" and "Drive"
"Rick Wartzman really has brought Peter to life in "The Drucker Lectures". Reading this book, I practically felt as though I were seated in the audience, listening to my friend and hero, Peter Drucker-truly one of the great geniuses of management. These lectures are as vital today as they were when Peter delivered them. They cover significant territory, from the importance of faith and the individual to the rise of the global economy. It's a classic collection that belongs on every manager's bookshelf." -Ken Blanchard, coauthor of "The One Minute Manager" and "Leading at a Higher Level"
"Thank you, Rick Wartzman, for the pleasure of learning from the witty, informal Peter Drucker as his ideas unfold and his remarkable mind grapples with challenges of management that are still with us today." -Rosabeth Moss Kanter, Harvard Business School Professor and author of "Confidence and SuperCorp: How Vanguard Companies Create Innovation, Profits, Growth, and Social Good"